The sun has dipped beneath the line of the hills, and the grove is suffused with the dove gray of the twilight. The Celts had considered sunset to be the start of the day, as they considered the waning light of Samhain, summer's end, to be the year's beginning. You consider this as a Druid kindles the sacred fire at the grove's center, using a long taper from the altar. Slowly, the flames spark and the kindling catches, suffusing the grove and its faces with a rosy glow. “Now is the time to give our offerings and our devotion to the Gods and the season,” the ritual leader announces in a calm yet sonorous voice. Her white robe captures some of the twilight's fading glow, and the beads at her corded belt flash as she moves around the circle with an offering basket. One by one, all assembled make their devotions. A woman in green has brought a harp and makes her offering of song, her voice rising to the darkness of interlaced branches above. You let yourself float upon the beauty and sacredness, as your eyes catch the first stars emerging from the fabric of night. You feel the Gods of the season watching joyfully in your mind's eye, their image as detailed and fine as everything before your opened eyes. The song ends. A man reads a poem he has written to the Goddess being celebrated tonight, and offers it to the eager flames. Several place objects in the basket – satchets of dried herbs, mostly, a piece of homemade bread – murmuring prayers. They will be offered to the flames, you know, basket and all. The Druid with the offering basket comes to you then, a smile on her lined face. What will you offer to the Gods this night? What gifts will you share with the Gods, the Nature Spirits and the Ancestors? With a mix of excitement and calm, you raise your eyes and make the offering. Welcome, seekers and fellow travelers, to the Henge of Keltria! Keltria is a form of modern Druidry, a spiritual path dedicated to revering the Nature Spirits, honoring the Ancestors, and celebrating the Tuatha Dé Danann, the Gaelic pantheon once worshiped throughout Ireland, Scotland and the Isle of Mann. The Henge of Keltria, a religious association was established in 1987. That association was incorporated as a nonprofit religious corporation, The Henge of Keltria, Inc., in 1995. Established as a religious association in 1987, the Henge of Keltria achieved 501 (c)(3) non-profit status in 1995 and is dedicated to providing information, training and networking to those who practice or are interested in our Druidic path. Membership is free and open to all, the latter at the discretion of our Board of Trustees and Council of Elders. Keltrian Druids celebrate their rites together in study groups and groves, although many of us are solitary practitioners – and welcomed into the faith on equal footing as those blessed enough to have a grove in their area. Click here to learn more about the Board of Trustees, the Council of Elders and our Groves and Study Groups. Simply put, the Druids were the religious specialists of a group of people we refer to as the Celts, although that wasn't their name for themselves. Originally from Central Europe, Celtic culture moved west to encompass Western Europe, including France (once known as Gaul), parts of Spain, Ireland and Britain. Celtic peoples also invaded and settled in parts of modern-day Turkey, Italy and Greece. They were (and are) an Indo-European people, speaking languages related – however distantly – to many of those in Europe, northern India and modern-day Iran. Celtic languages had two main branches, which we can use as shorthand for a division of culture. One branch gave rise to modern-day Welsh, Breton and similar tongues; the other gave rise to Gaelic and its variants. This latter group of people are referred to in literature as the Gaels, although they would have probably have given their specific tribe name if you had asked them who they were. Druids were both male and female, and endured training in an oral tradition than spanned a decade or more. They were poets, storytellers, keepers of geneology and lore, as well as ritual specialists, kingly advisors, healers and seers. In short, they were the experts of their day – an oral culture's equivalent of the intellectual elite. While the Gaels did have their own writing system known as ogham, they did not write down matters of the sacred, and thus what they actually passed down from Druid to Druid has been lost to time. We reconstruct these practices through a reading of the lore: the myths and stories preserved by monks of their Pagan past. Unlike Abrahamic religions, this lore isn't a sacred text, unalterable and infallible; the lore was altered by those who wrote it down, and who opposed the polytheistic, non-Christian world view these stories likely represented in their original forms. As altered and insufficient as it may sometimes seem, the lore offers us signs and a map of sorts to reconstructing Druidic practice. We also gain the tools to reconstruct Druidic practice through a study of history, archaeology, language and related cultures in the Indo-European sphere. Above all, we are inspired by the Gods and Goddess, the Nature Spirits and the Ancestors, who give us their own wisdom on the shape of our spiritual practices. Still, we don't pretend to be the direct descendants of ancient Druids. We are modern Druids, practicing a faith relevant to the modern world while drawing on ancient sourcewaters. The Henge of Keltria is currently structured around nine hallmarks that delineate our basic practices and beliefs; in other words, they are what define us as members of Keltria, as opposed to other spiritual paths. This is accomplished through our rituals and sensing their inspiration in our lives. This is also achieved through ritual and awareness of their messages received as we move through our daily routines. As with our Gods, Goddesses and Nature Spirits, our Ancestors provide us with guidance and encouragement. You do not have to be of any specific ancestry or heritage to practice Keltrian Druidry. We welcome people of all backgrounds. It is wrong to kill or maim without reason, regard and necessity. We place the responsibility of choice firmly in the hands of the individual. An individual determines their own ethics based on self-respect and consideration of others. Justice is best served not by reward or punishment, freedom or confinement, but in the efforts toward restoring the health of broken relationships. Our purpose in life is to grow and evolve in wisdom. We do not have the one, right, only true way. The Henge of Keltria provides a framework for self-exploration and choice. The Henge of Keltria is prepared to accept new, proven scholarship even if it alters core practices. We recognize the importance of an individual's evolution and provide guidance when requested. Engaging in a spiritual path of any type requires the devotion and dedication of the individual, in balance with his or her other responsibilities, roles and desires. It doesn't require blind faith. We encourage you always to read, question, read some more and, above all, engage – through ritual work and through human connection with your fellow Druids. 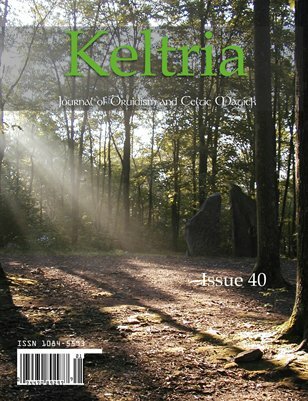 To learn more about Keltrian Druidry, we encourage you to read The Book of Keltria. Another must-have: The Keltrian Book of Ritual, which provides a step-by-step guide for our ritual format – the what, why and how of our workings. Click here to purchase the latest edition. We also encourage you to visit our Well of Wisdom blog and read both current and archived posts; it's a treasure-trove of Keltrian articles and continues to be updated. If you are in an area with a working grove or study group, we encourage you to reach out, if your schedule and circumstances permit; click here for a list of groves and study groups. You can connect with fellow Druids in the virtual world via Facebook and our Yahoo Group. If you would like to deepen your ritual practice and work toward initiation, contact the Henge and we will assign you a mentor to work through the study program. You must perform Keltrian ritual as a spiritual practice for at least six months – preferably a year – before asking for a mentor. This will give you the time and experience to discover whether Keltria is a good fit for you spiritually. Working through the study program is done on your own pace, but does require both reading and writing assignments. Initiation is not guaranteed, but depends on the work you put into the program as well as a determination from the Council of Elders. Now, if the path sings to you, take your place by the sacred fire, make your offering and link your hands with your brothers and sisters. Like the roots and branches of trees, we connect with each other – with the sky and the land, and the sacred that surrounds us all.